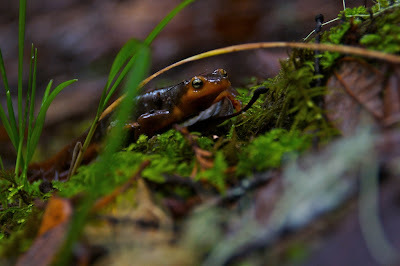 Newt in Portola Redwoods State Park. It's mid-December already and winter is just around the corner which means for the next few months the banana slugs will be sharing the forest floor with one of my favorite critters - newts! A form of salamander, newts go into a kind of summer hibernation called "estivation" (bet you can't wait to use that word at parties!) underneath rocks in the warm months. Once the mercury drops and the rain soaks the forest though these ampibians make their way across a carpet of decaying leaves towards creeks and ponds to mate. The redwood forests up and down the state, but especially in the Santa Cruz Mountains have a particular abundance of newts. They can be found in every pocket of the Bay Area rotating their little arms around and crawling through shady woodlands. Hike in the Rain! This is when newts are most active. If not in rain, hike on a cloudy, drizzly day. Hike near water features like creeks, lakes, and ponds. This is where the newts do their mating. Newts love shade, so stick to well forested trails. Nice photo. I usually have a bear of a time trying to get decent photos of newts. There's always such low light, and they rarely remain still. they're as bad a swallowtail butterflies. I feel bad for saying this but I think that one was so scared to death of me he couldn't move. Which probably isn't good for his tiny amphibian heart, but is good for my photography. My approach is typically to get on the ground with the newt, set the camera on autofocus and shotgun it with my eye away from the camera. I have a pretty good sense of composition even with my eye off the back of the camera its mostly a question of getting the focus right.